Park Districts across Illinois appear to have problems with the definition of “compensation” as it relates to their Commissioners. Compensation means anything not available to the general public under the same terms and conditions as received by park commissioners. 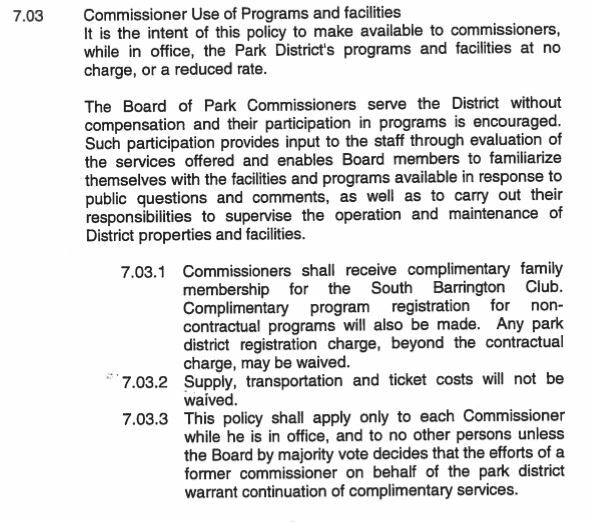 Commissioners of the South Barrington Park District have been receiving “free” and “discounted” items while serving in their capacity as park commissioner. The district attempts to cloak these free items under the alleged “need” to evaluate the programs and facilities of the park district. This does not apply, for the simple fact a commissioner could attend once or twice, get reimbursed for his or her actual expenses, and furnish a written report of their evaluation to district staff – no need to include their family members in any evaluation. I suspect some attorney came up with this language in an attempt at circumventing state law. It doesn’t hold water. The South Barrington Park District Board of Commissioners are: John Kazmier, Maureen Hawkinson, Susan Butera, Baree Paik, and Peter Persisn.